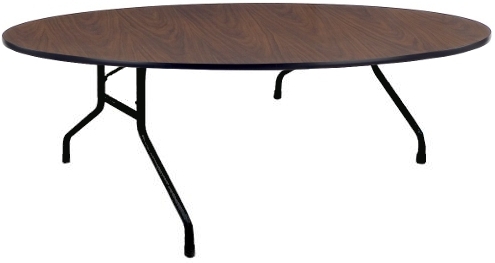 This 48" round folding table features a melamine top on a 5/8" thick particleboard core. Shown in walnut, but available in 4 other colors. You have 3 edge, and frame color options. Melamine top tables are an economical option to traditional laminate top tables. They are meant for office, church, or any other light use application. If you are a banquet hall, hotel, etc. where your tables are constantly used for events, you should go with a high pressure laminate top. The walnut top, black edge, and brown frame ships in 3-5 business days. All other color combinations ship in 10 business days. Non-Damaging plastic foot caps and edge molding.